Microsoft has released Power BI Mobile update for June. It’s packed with really great improvements and a number of new features. Finally we can …. you can zoom into your current location to see only points that are near you. you’ll be able to filter reports with geographical data by your current location in just one tap. you’ll be able to filter your data by that city, state, or country. As long you’re using the app, the filter will remain in effect in the reports to which it was applied. With Power BI Mobile, QR codes become the link between anything in the real world and related BI information, with no navigation or search needed. Now when you scan a QR code that was generated using the Power BI service, the tile will render in AR mode. With AR, you can stay in the context of the real world, and get your data in a virtual overlay. Tap the image to enter interactive mode for the tile and navigate to its parent dashboard. A barcode is an optical machine-readable representation of data relating to the object to which it is attached. With the Power BI scanner for iOS, you can now scan barcodes and display related reports filtered by the scanned value. Stay tuned for a Barcode deep dive blog post. 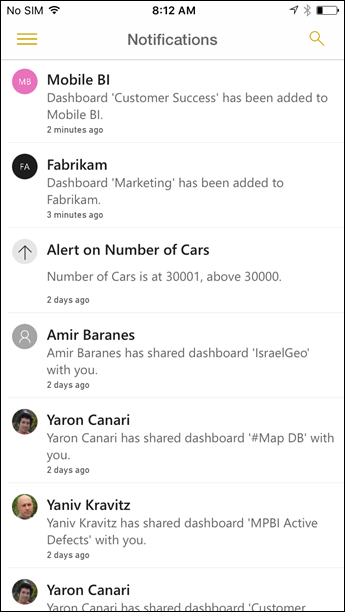 The notification center has also now debuted in the most recent version for Android and Windows 10 Mobile, and they have improved the notification center for iOS by including all possible alerts, from data details to shared dashboard notifications. On the Power BI Mobile app for Windows 10 they added the ability to drill through from a KPI to mobile report, or to any custom URL. Meanwhile, the Android app includes several bug fixes, including fixing the currency symbol for SQL Server Reporting Services KPIs. In this release they have resolved some bugs reported, and also applied selection control to mobile reports. You can control the selection mode of the slicer when editing on Power BI Desktop, and this will automatically impact the way slicers work on mobile. Choose between Single selection to allow one slicer at a time, or select Select All to allow the selection of multiple slicer values.